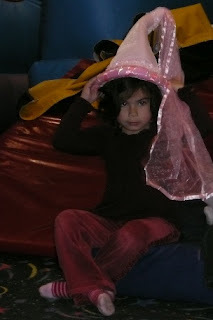 We had Roo's party at Pump It Up so we could invite all of the kids in her class without worrying about weather. I think there ended up being about 26 preschoolers running, jumping, dancing, sliding… and Jasper wanted to be right in the middle! Here are some highlights. 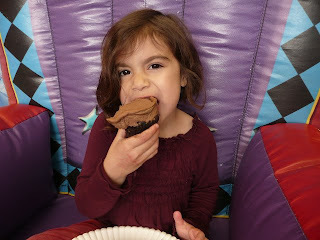 There were a ton of other kids, but I don't like posting pics of other peoples' children without asking, so it looks like Roo and Jasper celebrated her fifth birthday alone. I suggest you hit mute when watching the following video (shot on my beloved Flip Mino HD) so you don't have to listen to my horrible mommy cooing. We were playing peek-a-boo and apparently I got a little overzealous. Honestly, I was probably just relieved Jasper didn't make me carry him up to do the big slide again. That, my friends, is a workout. Anyway, Roo is five! Woo-hoo!!! Happy Birthday, Big Girl. The princess. What a fun place that looks to be and thank goodness FOR places like that, hmm? And yeah, I remember the old trip up the big slide. Oh, the things we do at parties. There was no "horrible cooing", that was adorable! 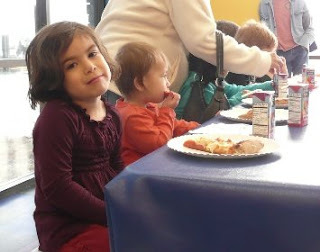 Both of your kids are just so cute :) Glad she had a great birthday! We had such a great time - Roo and Jasper were adorable! I hope she enjoyed her special celebration as much as everyone else did! P.S. We love the "Roo" pin. Kamy said, "Mommy! Look! You can wear this and see Veronica Roo all day long!" wow - I did not realize she is so big! Five - makes your head spin. They do grow so fast.... My littlest is six and I wonder where all the time went. Happy Birthday Roo! She's grown into such a beautiful girl! Adorable! She looks like she has a lot of personality...and she's also so beautiful. I've stuck to the "my friends and family" parties so far. Not sure this year whether we'll expand beyond that, but definitely once she's in preschool. I'll need tips then. Naomi, I cannot believe that I didn't comment on this post!!!! I'm such a terrible friend! Please don't comment on my post for SoJo's birthday until the end of April so we can consider ourselves even. I honestly think I was reading this and was interrupted and my computer crashed (it does that sometimes when it's supposed to go to sleep). Enough excuses, I just wanted to write that it looks like everything was just perfect! I especially loved the video of your two cuties. Roo was so cute with Jasper, giving him that kiss. And I love how cute the birthday girl looks in the second photo, like "yeah mom, just take the dumb picture." Her top is adorable! Great color on her.